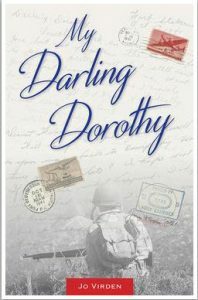 Mary’s note: I’m delighted to be a part of Jo Virden’s blog tour for My Darling Dorothy, a World War II love story. I was fascinated at the back story for how this book came about. Jo found a bundle of letters from World War II in her mother’s basement that held a mystery: who were the young soldiers who wrote these letters and what happened to them? In this post, Jo Virden talks about how she used the real life letters as the inspiration for her story. My Darling Dorothy is available on Amazon.com. What was your process for turning those real-life letters into your story? Were they just a jumping off point for a completely fictitious story or did you incorporate the actual letters into your plot? The first thing I did was to read each letter and take notes on anything I thought sounded interesting. When I finished reading the first set of letters, I began to formulate the story based on what was said in the letter. I had no letters from Dorothy, so I had free reign to formulate what I thought her response might be, and the story took off from there. That one sentence set up the entire storyline regarding Tommie and Dorothy having a Christmas wedding. Is My Darling Dorothy fiction? The story is not completely fictitious.There is a thread of truth that runs throughout the novel. For example Dorothy had a real-life friend named Carol Brown who was her next door neighbor just as it is depicted in the story. Carol, however, was the same age as Dorothy, not four years older, and she did not work at the AAA as I described in the novel. Changing her character filled the need for an older woman to whom Dorothy could turn for advice, and having her work in the same office as Dorothy made it easier for multiple conversations to take place. The letters also served to pique my curiosity. I learned through the letters which company Smitty was assigned to. With that piece of information I was able to research the company and find out where they were during the war. Once I found that out I was able to piece together where Smitty was when he was writing certain letters. The Rapido River crossing part of the story evolved from this process. Once I learned how horrific that battle was, it became fairly easy to piece together what it must have been like for Smitty. It made it easier to “read between the lines” when he said things like, “You or anybody else, has no idea what it’s like over here.” Again, the thread of truth runs through the story, but evolves into pure fiction. I am considering writing short stories about the minor characters in My Darling Dorothy. I also have notebooks full of short stories that are patiently waiting for some attention, so that will be my first endeavor once My Darling Dorothy is well on its way. That doesn’t mean I’m not working on anything. As all writers will attest, there is always some remnant of a story running through our minds. When it’s ready, it will come spilling out onto that yellow college-lined legal pad. Follow My Darling Dorothy’s Blog tour! Next PostVirtual Blog Tour for Forever Fit and Flexible starts Monday, Oct 3!